It's been a banner week for Fox News - both Roger Ailes and Bill O'Reilly are once again embroiled in sexual harassment scandals. The New York Times revealed that Fox News has paid $13 million to keep no less than FIVE sexual harassment suits against Bill O'Reilly hushed up. And former Fox News chairman, Roger Ailes, who left the organization after a similar scandal in July (for which he received a $40 million "exit package"!) is once again the subject of a new sexual harassment suit from Julie Roginsky, a liberal commentator. It's as disgusting as it is easy to believe. What makes this newsworthy is that Fox News has already lost two major advertiser as a result of these squalid revelations -- Mercedes Benz has just pulled its ads from the network, saying, “Given the importance of women in every aspect of our business, we don’t feel this is a good environment in which to advertise our products right now.” Nutrish, a pet food company, has also made the decision to pull its ads. 1. Thank Mercedes Benz for pulling its ads. Tweet at them, message them on Facebook, or email them. Feel free to use some version of the sample text below. Thank you for your recent decision to pull your ads from Fox News in response to this latest round of sexual harassment allegations against both Bill O'Reilly and Roger Ailes who are clearly both deeply troubled people who have little to no respect for women. I appreciate your decision and the message it sends to women and to your customers. 2. 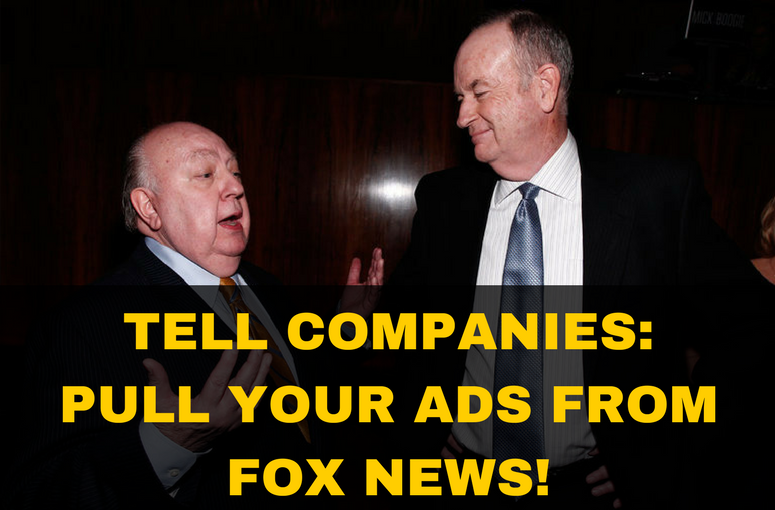 Urge other major Fox News advertisers to pull their ads. There are way more advertisers than this but start here (and leave a comment if you know of others.) Sample comment and tweet are below. @JennyCraig please pull all your ads on @oreillyfactor - supporting a proven, serial sexual harasser is not the image you want to project. @lexus please follow @MBUSA lead and pull your ads from Fox News. O'Reilly's & Ailes' serial sexual harassment will tarnish your brand, too. @CFPBoard Please pull your ads from Fox News ASAP. Supporting serial sexual harassers is not something your brand should be associated with. I'm writing to urge you to pull your ads from Fox News ASAP in light of the (most) recent sexual harassment scandals. Host Bill O'Reilly and former chairman, Roger Ailes' behavior is disgusting and completely unacceptable and not something you should allow to tarnish your brand. Thanks so much for your time. 3. Share this post with 5 people.